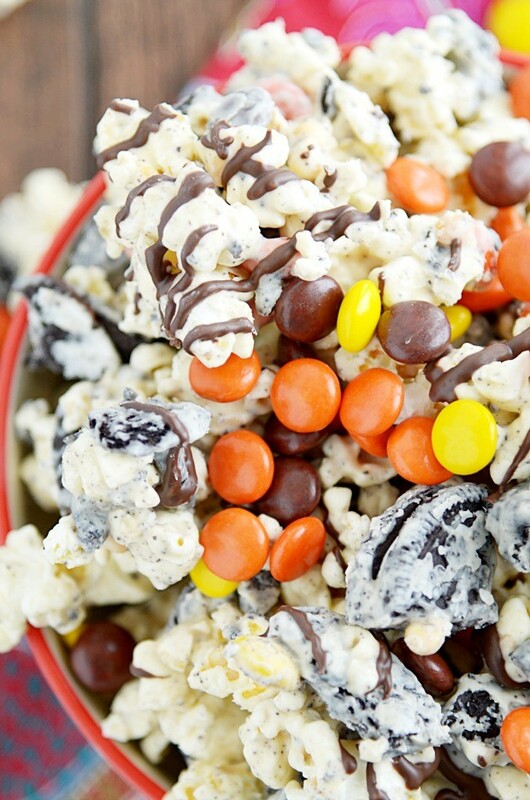 Crunchy, creamy, sweet and peanut butter-y popcorn. Ready in under 30 minutes, and you won’t be able to put it down! I’ve obviously been in the mood for snacking lately. I don’t know if it’s me trying to prepare lots of Super Bowl recipes, or if it’s just the fact that I’ve been dieting for 19 days a billion years. Either way, munchies have been on the brain, because the past two weeks of recipes have included 2 snack mixes and 2 dips, plus today’s popcorn and yet another dip recipe tomorrow. ???? 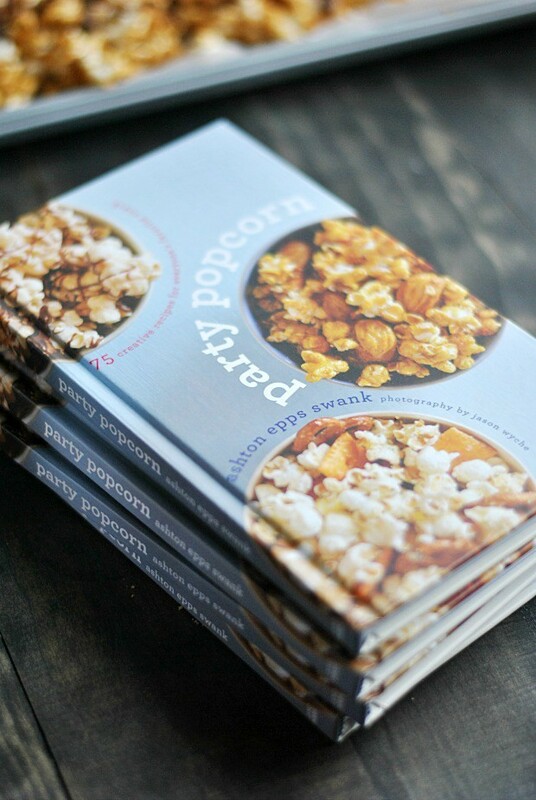 Today’s popcorn is one of my favorites from the book, Peanut Butter Chocolate Chip Popcorn (on page 75)! 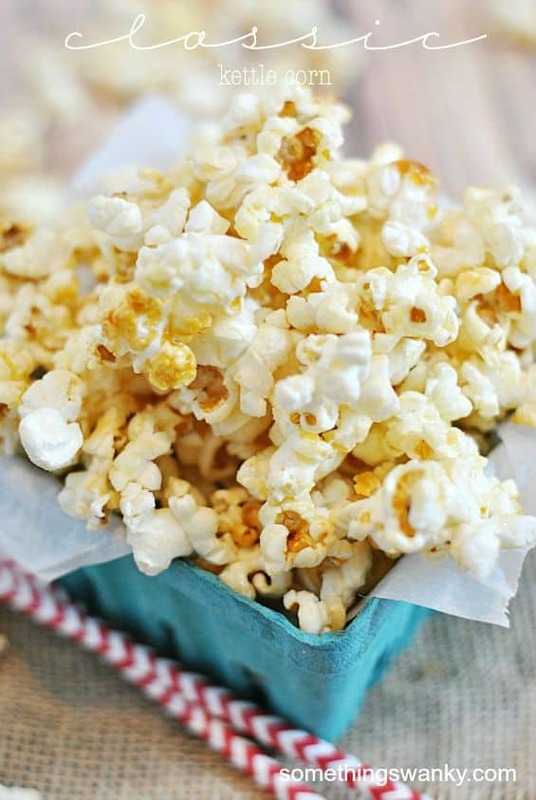 This is one of my most used go-to recipes for a quick and easy popcorn treat that can be packaged for giving away or for entertaining guests. 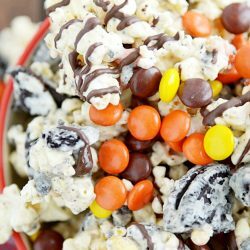 This Ultimate Peanut Butter Popcorn recipe is a slight variation on the chocolate chip version in my book. Beyond creamy peanut butter and white chocolate, this version is also stuffed with lots of Oreos (is there a more heavenly combination than Oreos and PB? ), Reese’s Pieces, and a chocolate-y drizzle. Yes, I know we all love REAL chocolate chips the best. But candy melts will work SO MUCH BETTER in candy making and coating, because they are made specifically to melt well. They melt smoothly and quickly without seizing, they coat better than normal chocolate, they cool and harden quickly, and the hardened coating won’t melt all over your hands when handling. Just use the melts please (available at Target, Walmart, Michaels, and other stores). 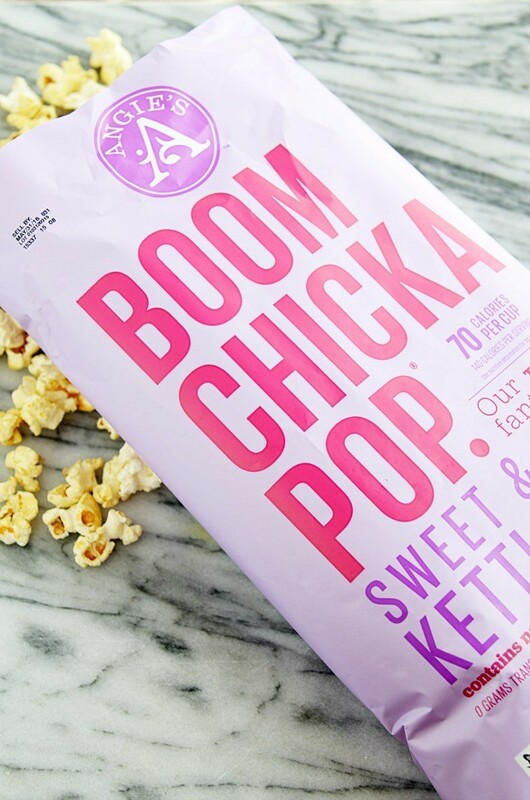 And you might also remember me saying this before, but it bears repeating: I LOVE this Boom Chicka Pop (found at Target) for my popcorn munch mixes! 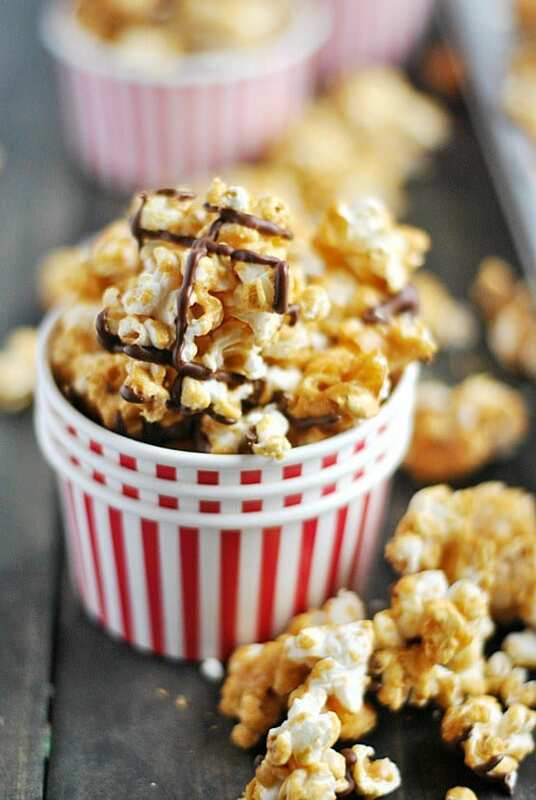 It’s sweet and crunchy, with a sugary shell that protects the kernels from any sort of moisture from the chocolate. And it’s just overall perfection. Of course, you can always use microwave popcorn or air popped (which has always been my preferred method in the past, I melted through TWO poppers when I was writing the book!). Your choice. But if you can get your hands on some bagged kettle corn, you’ll save a little time plus add some sweet crunch to every delectable bite. I made another video for you!!! I’m brand new to the video-making thing, so I don’t have many under my belt yet. But I’d say this one is already a big improvement from the first, and I’ve been SO excited to share it with you. What did you think? My brother and I have been working so hard on making more videos for you, and I can’t wait for you guys to see them. For now, I hope you fall in love with the Peanut Butter Popcorn as much as I have. 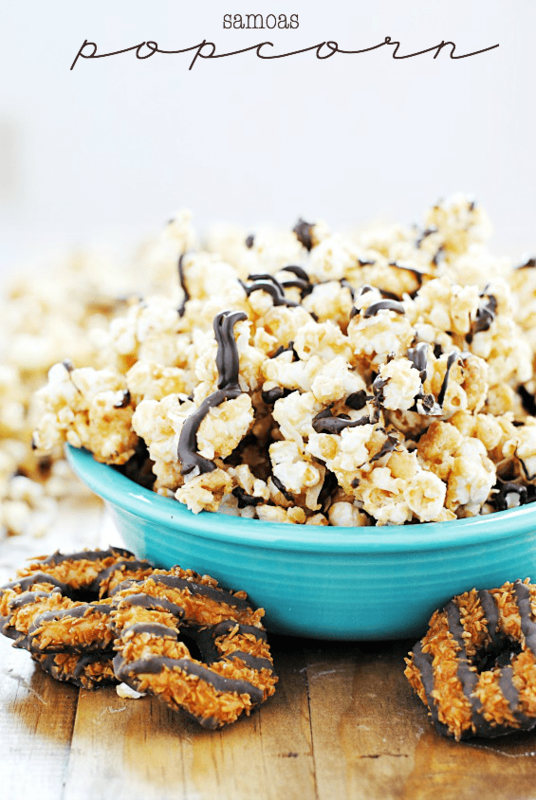 It’s perfect for a quick, last minute treat and completely addictive. 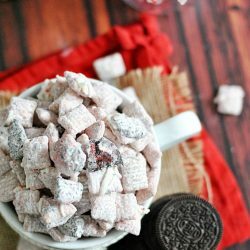 For a fun variation, try adding M&Ms, PB cups, Nutter Butter cookies, or miniature marshmallows! Just to name a few ????. 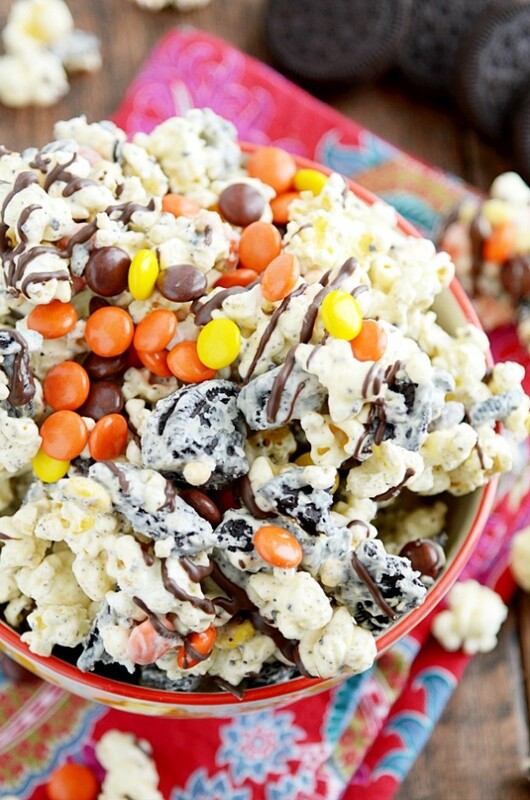 Crunchy, creamy, sweet and peanut butter-y popcorn. Ready in under 30 minutes, and you won't be able to put it down! Place popcorn in a large bowl. Be sure to remove any unpopped kernels! Melt together the white chocolate and the peanut butter (according to the directions on the candy coating package). Stir until smooth and pour over the popcorn. 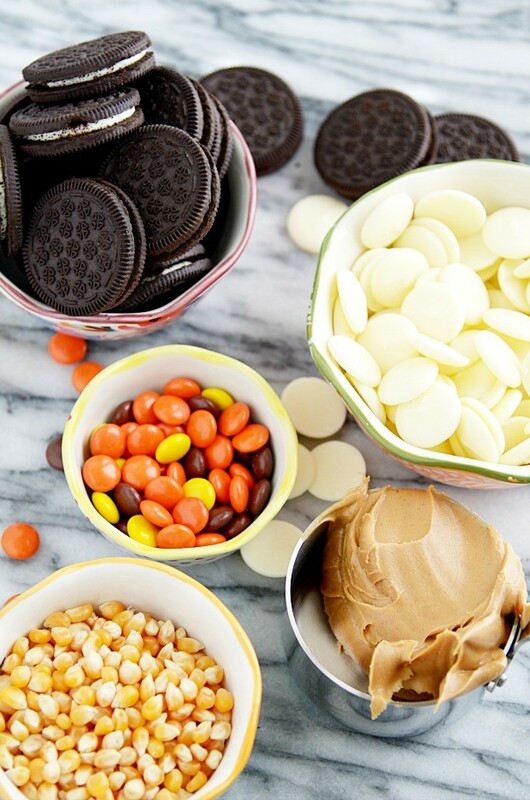 Add the Oreos and the Reese's Pieces to the bowl. 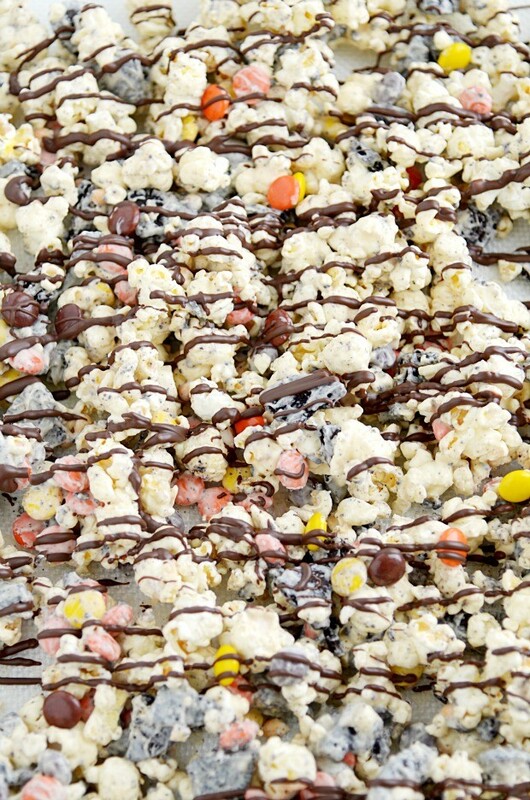 Gently stir with a spatula to mix and coat everything in the candy coating. Spread the popcorn on a large sheet of parchment or a silicone baking mat. Microwave the milk or dark chocolate in a ziplock bag for 1 minute. 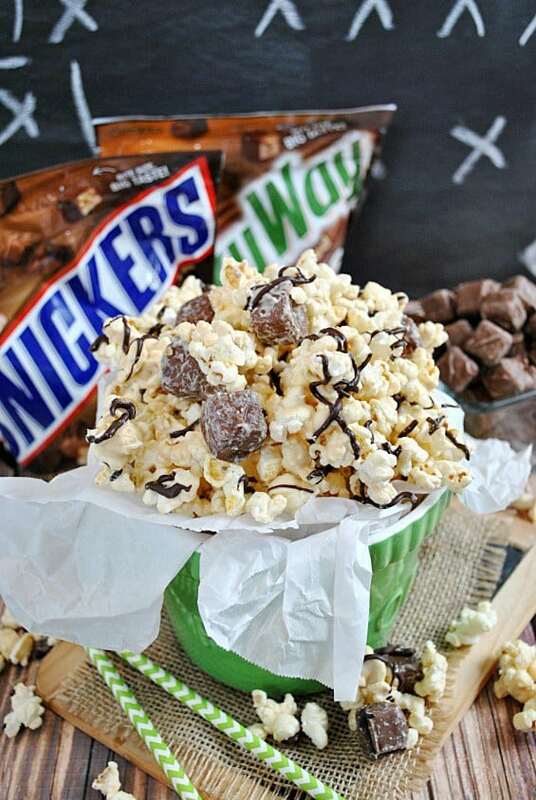 Snip the corner off and pipe the chocolate over the popcorn. Let cool for 10-15 minutes to dry and harden before serving or packaging.